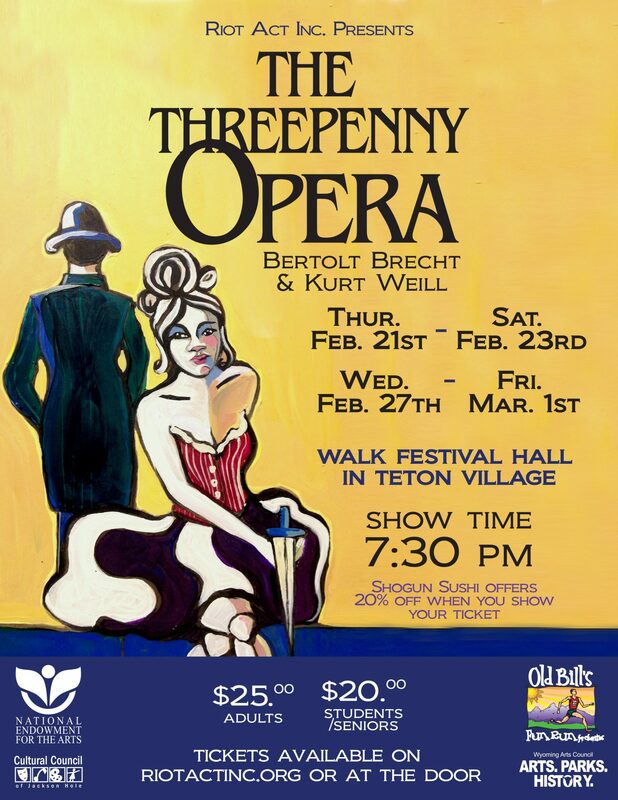 The Threepenny Opera – Riot Act, Inc.
Riot Act, Inc. presents The Threepenny Opera by Brecht and Weill Thursday, Feb. 21-Saturday, Feb. 23 and Wednesday, Feb. 27-Friday, March 1. Performances begin at 7:30 p.m. at Walk Festival Hall in Teton Village. Tickets: $25 adults, $20 students/senior, available in advance at www.riotactinc.org or at the door. 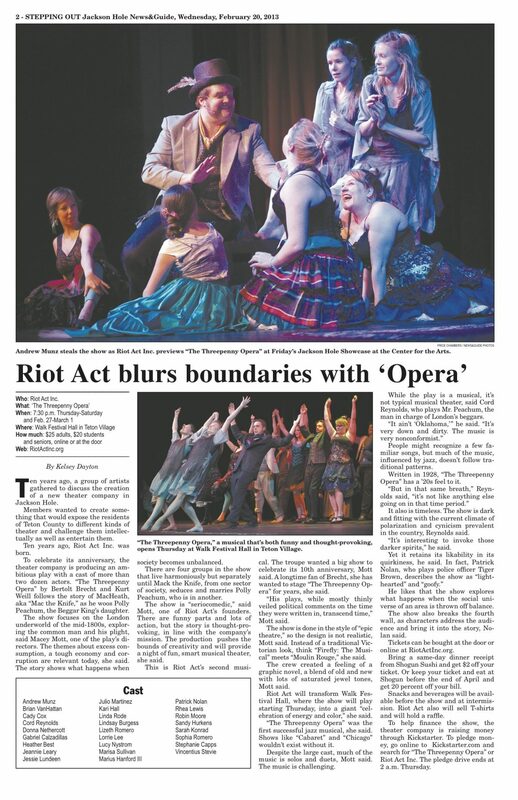 The Threepenny Opera by Bertolt Brecht & Kurt Weill will mark Riot Act, Inc.’s second staging of a musical in Jackson following the huge success of The Rocky Horror Show in 2009. The play follows MacHeath “Mac the Knife” as he swoops Polly Peachum, the beggar king’s daughter, off her feet. While it was written in 1928, Threepenny remains relevant for audiences today as a commentary on the plight of the everyman. Such popular and memorable songs as Mac the Knife, Jenny the Pirate, and Solomon’s Song all came from Threepenny, which also inspired other jazz musicals including Cabaret and Chicago. Riot Act Inc, will transform Walk Festival Hall into a giant celebration of energy and color. Audiences can sing along to favorite jazz standards while supporting local Jackson Hole talent in the process. 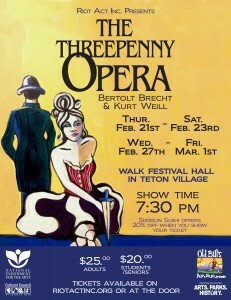 Threepenny will push the bounds of creativity and be a thought-provoking, fun, smart evening of music and theater. The Threepenny Opera boasts a rich cast more than 25-strong, including: Andrew Munz, Brian VanHattan, Cady Cox, Cord Renyolds, Donna Nethercott, Gabriel Calzadillas, Heather Best, Jeannie Leary, Jessie Lundeen, Julio Martinez, Kari Hall, Linda Rode, Lindsay Burgess, Lizeth Romero, Lorrie Lee, Lucy Nystrom, Marisa Sullivan, Marius Hanford III, Patrick Nolan, Rhea Lewis, Robin Moore, Sandy Hurkens, Sarah Konrad, Sophia Romero, Stephanie Capps, and Vincentius Stevie. The incredible crew and designers includes: co-directors Macey Mott and Cynthia Huyffer, choreographer BJ Hanford, musical director Jason Fritts, voice coach Jessica Garnick O’Neil, lighting designer Doug Vogel, set designer Mike Conlin, pianist Tony Saladino, fight director Marius Hanford IV, painting by Elyse Kennedy and many, many more. Concessions including snacks and beverages will be available before the performance and at intermission. Riot Act, Inc. T-shirts will be available for sale for $15 each and both men’s and women’s sizes are available. The popular Run of Show Raffle will also be back, offering great prizes with tickets available at the concession stand for $5 for one or $20 for five. Tickets available in advance on our website at www.riotactinc.org or at the door. Anyone who shows a dinner receipt from Shogun Sushi (same day only) will receive a $2 discount on the price of a ticket OR show your ticket from The Threepenny Opera at Shogun Sushi and receive 20% off your bill (expires 30APR13). We are also running a Kickstarter Campaign for this show. 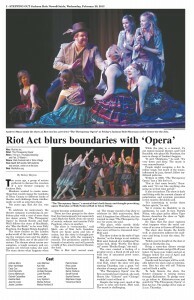 Riot Act, Inc. is excited to announce that our Kickstarter campaign for The Threepenny Opera is now live. Please visit http://www.kickstarter.com/projects/riotactinc/riot-act-inc-presents-the-threepenny-opera to pledge to our cause and also see our really cool video. Pledges have great incentives. For more information, contact riotactinc@earthlink.net or 307-203-9067 . *Project made possible by grants from Wyoming Arts Council, Cultural Council JH, and Your donations and support. Online Ticket Sales Close day of show at 5:00pm. After that time, please purchase at the door.